What makes Android so attractive is that it affords users the possibility to uniquely adapt the look of their Android devices using apps and widgets. That said, many – if not most – Android phones are per se somewhat limited when it comes to creative configuration. Luckily there are few very competent launchers and apps lurking about the market; users can draw from these to help redesign and set up their Android phones to their taste and preferences. One of said apps is Launch-X Pro, our app of the week. As always, read on, you’ll find all the details and how-to regarding this app in today’s review. Feature Requests: Techies – and there are quite a few of us here at the AndroidPIT headquartes – love this type of feature; what it does is allow users to inform developers should they have ideas for functions which the application does not yet provide. Free to Pro: Provides information for users who had previously been using the free version of Launcher X and are now transitioning to the pro version. What's New - Changelog: Information regarding all new functions and changes since the last update. The application is available in English only, which is a bit of a shame considering how international the Android community is. On a more positive note however, editing widgets, etc. is a cinch and relatively self-explanatory, though you do need to have basic knowledge of the English language (which you do, seeing as you’re reading this review!). The Widget-Editor is the heart and soul of the application. As the name might suggest, with it you will be able to create, edit and delete widgets. 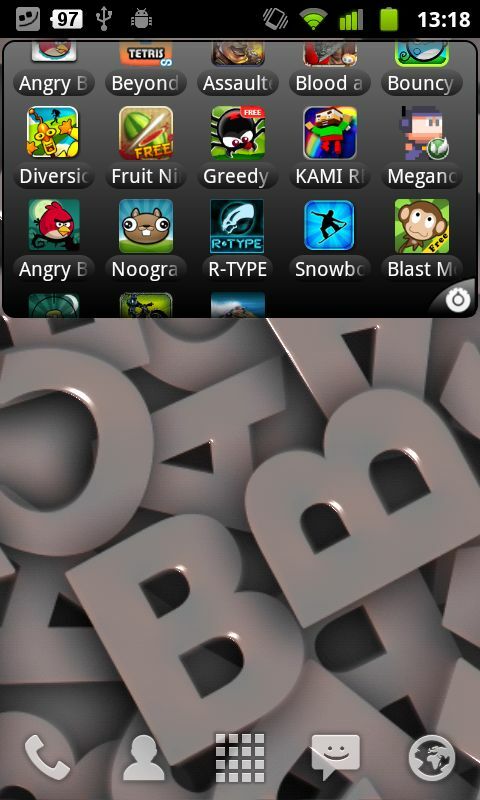 In order to create a widget press the device’s menu button and then hit Create Widget. Enter a name for your widget, and add apps, contacts and links to it, again by pressing the device’s menu button and hitting Select widget apps (you can skip this step if you don’t want to add anything to the widget). 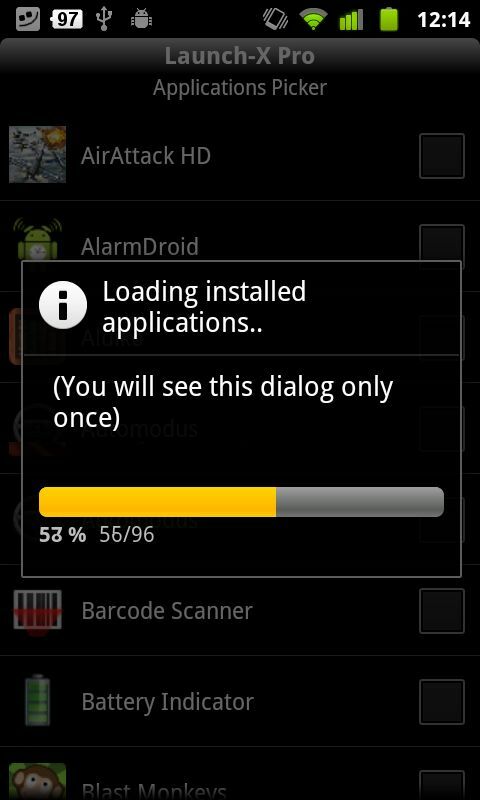 Widget type: There are scroll widgets and stack widgets (as of Android 3.0, i.e. only for tablets). What’s more, you will require a launcher that supports the scroll function—a few options: ADW Launcher, LauncherPro or GO Launcher. The spaces to displayed elements can also be selected, both for portrait or landscape viewing mode. Once you’ve made your picks and set everything up you can check out your creation in a preview (located at the end of the Widget-Editor, with live updates). Elements can be moved about using drop and drag in the preview; push down longer on elements for scroll/stack widgets in order to move them. Should you wish to move an element from one screen to another within the widget, simply pull it the edge of the widget. Your personal wallpaper is also shown in the preview, giving you a very accurate idea of what the widget will look like once you’re done with it. For some this might seem like a minor detail, but I was pleasantly surprised by it. 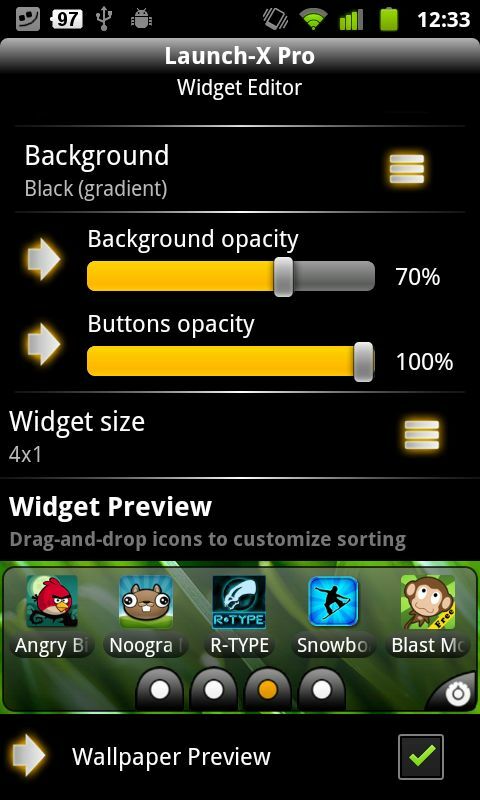 A few notes regarding the widget size: the amount of icons/rows harboured within a widget is unrelated to the widget’s size, meaning you can choose a 4x2 size for a widget, but the widget itself will only contain approx. 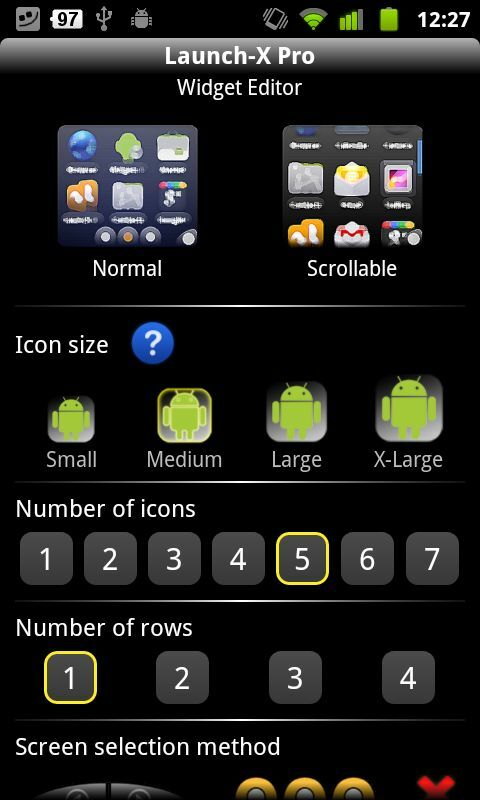 3 rows with 6 icons each (depends on what you choose). There are lots of available formats, ranging from 2x1 to 5x3 for tablets. Once you have finished creating the widget you can place it on the homescreen. NB: There can be button-overlapping when using small widgets (e.g. 3x1). Should this be the case for you, I recommend playing around with things and trying to add or take away elements. The last resort would be changing the widget size. Should you have a launcher that allows you to alter the size of widgets (such as LauncherPro Plus) installed on your smartphone, you will be able to change the widget size even after it’s been placed on the homescreen. Once you’ve finished working on the widget hit your device’s ‘Back’ button so as to save the changes. 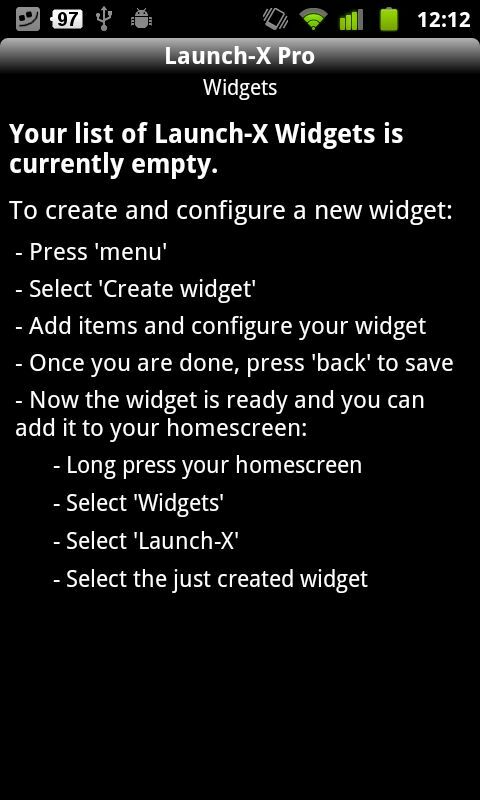 In order to place the widget on your homescreen, long press on the screen until the Widgets option of the menu pops up, followed by Launch-X Pro. You will then again have the option to select the format you want. Launch-X Pro is a fantastic addition to your personal launcher. It affords users to get creative, even when it comes to details, thanks to its numerous functions. It’s a great tool to help you organise your screen and make everything a little bit easier. I reckon Launch-X Pro is especially interesting to users who have a lot of apps and are finding it difficult to manage them all and keep their screens clutter free. A big bonus: the developer is willing to listen and help users when needed. That always just makes everything so much nicer. One clear advantage Launch-X Pro has is its very neat and logical set-up and the informative 'help‘ section, as well as the explanations provided for every option listed in the menu. 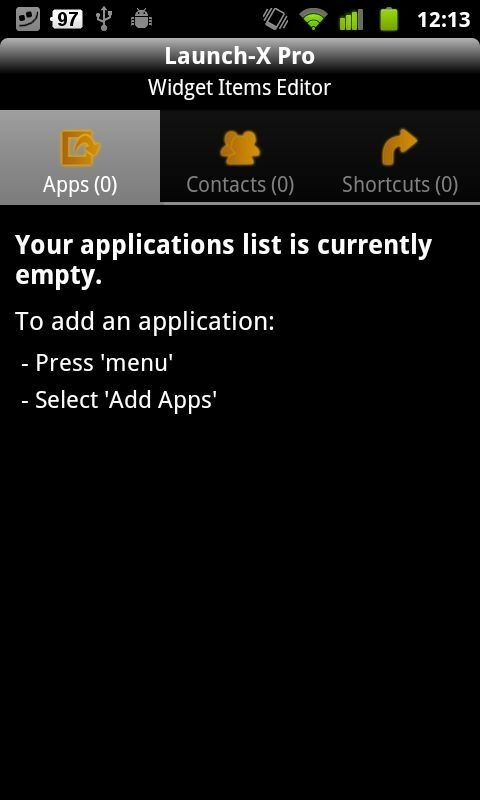 The tutorial is a good way to get in the loop on how the app functions, as well as which functions the app provides. Everything else is intuitive and easy to use, despite the ample amount of available functions. On a personal note: I’m not only partial to the application’s functionality—I also like the design. I tested Launch-X Pro in conjuncton with LauncherPro and was quite impressed by the results of this collaboration. There was one tiny bump along the way with one of the widgets: the apps harboured in the widget were no longer displayed. Luckily, this was easily resolved by selecting a re-display of the screen in the widget’s settings. Aside from this minor hiccup the app ran super smoothly throughout my test runs. For 1,49EUR you get a very competent application that helps you organise your smartphone according to your own preferences—a fair price if you ask me. Seeing as Launch-X Pro is our app of the week it is available for 0,59EUR from our App Center at the moment.